Area 51 is a primitive viewing site located in one of the darkest places remaining in South Florida. 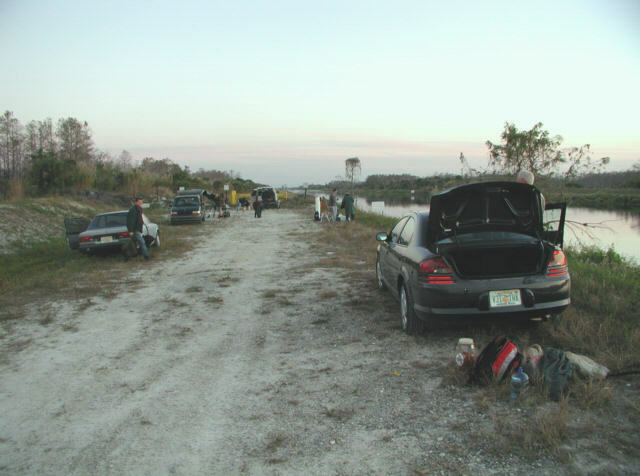 We set up our telescopes at the end of the line on a shell rock road along side a drainage canal. There is no electricity, and there are no facilities of any kind. In fact, the only thing the site has to offer is an unobstructed view of extraordinarily dark skies. Take I-95 to I-595 West (exit 26). Go west on I-595 to I-75. Take the Turnpike to I-595 West. Go West on I-75 to the East Gate toll booth at mile marker 24. Pay the $1.50 toll. The SunPass lane is on the far right. Continue West on I-75 to mile 51.7. There is no mile marker 51.7, so you must watch your odometer carefully. The exit is totally unmarked, and if you miss it, the next turn around spot not for another 50 miles. Exit to the right just before the crest of the hill and drive very slowly down the steep gravel road to the ground level below. The exit road will sweep quickly to the left. Continue driving to the end of the ramp where you will encounter a cross road just before the canal. Turn left (south) and drive under the I-75 bridge. Proceed south on this gravel road for approximately 3 miles to the end of the line. You have now arrived at Area 51. Find a parking spot and set up your telescope.